It’s been a brutal winter for flu, strep, stomach viruses and colds in the Charlotte area. Proper toothbrush care promotes good oral hygiene. To avoid the spread of germs, brush up on your toothbrush hygiene habits with these tips from Dr. Michael Gross at Inspiring Smiles Dentistry of Charlotte. Thoroughly clean your toothbrush after each use. Rinse your toothbrush carefully after each use. 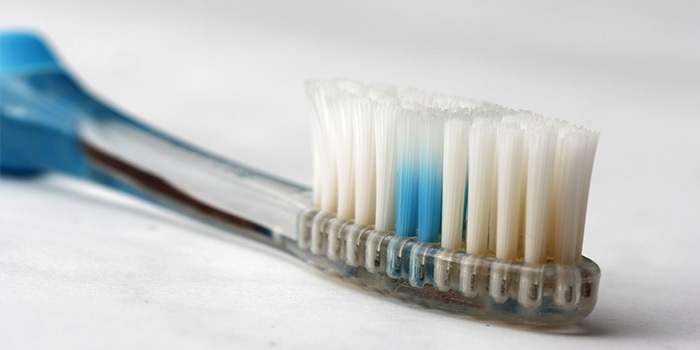 Make sure all toothpaste residue and food debris is removed from the bristles. Store your toothbrush in an upright position. Buy a toothbrush holder so your toothbrush can air-dry thoroughly in an upright position between each use and prevent bacteria growth. Don’t use closed containers for storage. A damp and dark environment is the perfect breeding ground for bacteria. Avoid covering your toothbrush bristles or storing your toothbrush in closed containers or medicine cabinets. If you share a bathroom and toothbrush holder with another person, please make sure toothbrushes do not touch and spread germs. Personal hygiene items should never been used by another person. Sharing a toothbrush exposes you to bodily fluids and germs. For someone with a compromised immune system, sharing a toothbrush can pose serious health risks. Replace toothbrush every 2-4 months. Bristles become worn and frayed after repeated use and will not effectively clean teeth and gums, especially in those hard to reach areas.